There are some circumstances that your mobile device has cached our server settings and once you get stuck in the app (loading constantly or not logging in) it doesn't connect properly to our servers. The updates made on our server are not updated on your mobile device because it has cached older settings. Here are instructions to reset your Wi-Fi and 3G so that it gets new server settings from our updates and you can use our app once again. Turn on Airplane Mode, wait 5-6 seconds, and then off again. 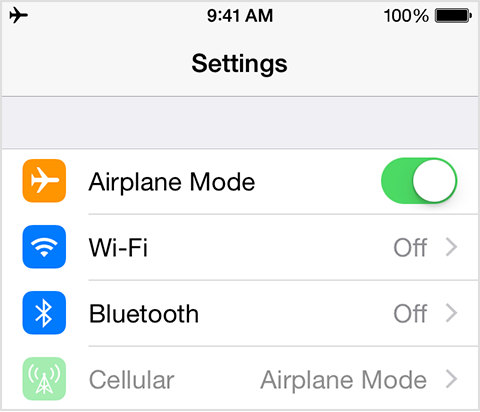 If you have a device with iOS 8.2 or earlier, Airplane Mode will also turn off GPS. Once this setting is on wait 5-6 seconds before turning it off again, thereby turning your Cellular and Wi-Fi on again. Some of this information applies only to devices running Android 5.0 and higher. If your device is running 4.4 or lower, the Menu icon looks like this . If your device is running 4.3 or lower, the Settings icon looks like this . Under “Wireless & Networks,” touch More. 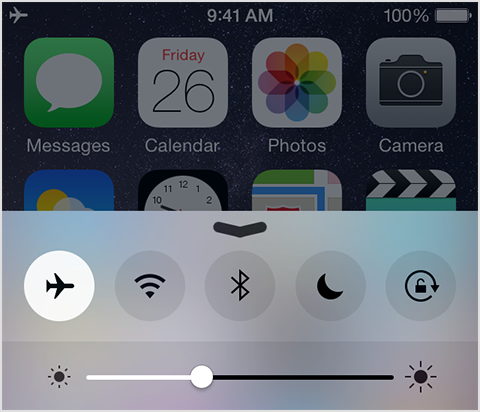 Turning on Airplane mode will turn off Wi-Fi and disable mobile networks and Bluetooth on your device. Android 4.4 or lower: Check the box next to "Airplane mode." Android 5.0 or higher: Touch the switch next to "Airplane mode" to turn it to the on position. Wait 5-6 seconds and turn if off again, thereby turning your Cellular and Wi-Fi on. If connection problems still exists you can perform a shutdown of your mobile device and when turned on again the cache will be cleared and you should be able to login again. Please contact us at support@ecompliance.com if you need any further assistance.